Relate a single contact to multiple accounts. Define a contact’s roles for each account it’s related to. Create a hierarchy among related accounts. You’re preparing to meet with Alan and Leung from Get Cloudy Consulting. You’ve done your research in reviewing their company’s past history with Cloud Kicks. Now you need to make sure you understand how the people, their company, and your team fit together. By understanding the relationships between contacts, accounts, and your internal team of sales reps, you’re able to close deals more effectively and efficiently. There are three specific types of relationships, each which offers a different view into the complexities of business relationships. Contacts to Multiple Accounts lets you relate a contact to more than one account so you can track the relationships between people and the companies they work with. See who has an indirect relationship with Get Cloudy and might be able to help move the deal forward. Plus, add roles to direct and indirect contacts so you know who’s your best bet. Account Hierarchy lets you see what companies Get Cloudy is affiliated with. Perhaps they have a parent company that you’ve already done business with. Finally, Account Teams tells you which sales reps are working on the Get Cloudy deal so you can better coordinate with your internal team. Your contacts might work with more than one company. A business owner might own more than one company or a consultant might work on behalf of multiple organizations. Your relationships may be complicated, but keeping tabs on them doesn’t need to be. When you relate a single contact to multiple accounts you can easily track the relationships between people and businesses without creating duplicate records. The relationship rules are still simple. Every contact needs to be associated with a primary account. This is the account that appears in Account Name and is usually the company the contact is most closely associated with. Any other accounts associated with the contact represent indirect relationships. The Related Contacts list lets you view current and past relationships, and capture unique and custom details about these relationships so you always know who you’re talking to—or who you should be talking to. In preparation for your meeting with Get Cloudy Consulting, you check the account record and review the list of contacts. Alan and Leung, who you’ve already been in contact with, are listed along with their titles and roles. But notice that Gordon James is also listed. Although Get Cloudy isn’t the account listed on his contact record, he’s consulted for Get Cloudy and might be worth reaching out to. To accurately represent the relationships your company maintains, you can modify the values in the Roles field and even create custom fields, such as a checkbox to denote the main contact for the account. Setup is quick and easy. Just follow these steps. From Setup, enter Account Settings in the Quick Find box, then select Account Settings. Select Allow users to relate a contact to multiple accounts. Add the Related Contacts related list to the account page layouts your reps use. 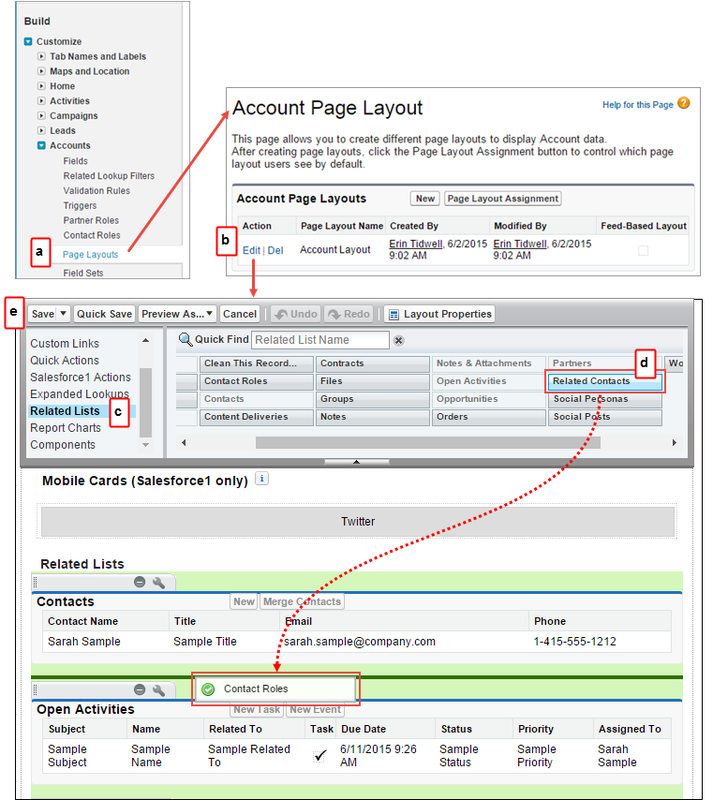 From Setup, enter Accounts in the Quick Find box, then select Page Layouts. Next to the appropriate page layout, click Edit. Drag Related Contacts onto the page layout. Because the Related Contacts related list automatically includes all direct contacts, you can remove the Contacts related list on your account page layouts. Easily see who’s a direct contact for the account when you add the Direct field to the Related Contacts related list. Add the Related Accounts related list to the contact page layouts that your reps use. It’s similar to what you just did in step 3. If you want to prevent activities from automatically rolling up to a contact’s primary account, in Setup, go to Activity Settings and deselect Roll up activities to a contact’s primary account. 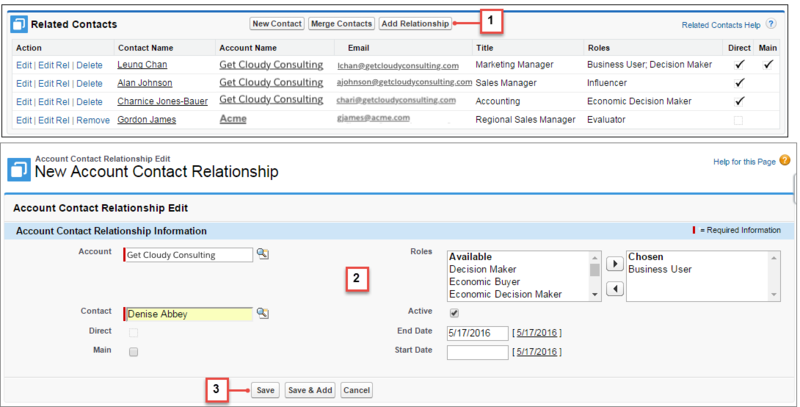 To look at the relationships between contacts and accounts, create custom report types. Now you’re ready to start creating relationships. From an account record, use the Related Contacts related list to create or edit relationships between accounts and contacts. Create a relationship by clicking Add Relationship. Edit a relationship by clicking Edit Rel (in Salesforce Classic) or Edit Relationship (in Lightning Experience). Fill in the information on the account contact relationship information. Alan and Leung work at the Get Cloudy Consulting corporate office in Boulder, but you noticed that when you searched for Get Cloudy that you have several other accounts with similar names: Get Cloudy Consulting East, Get Cloudy Consulting West, and Get Cloudy Consulting Canada. In the Get Cloudy Consulting West account record, Get Cloudy Consulting is listed as the Parent Account. How are all these companies related? Are you going to have to dig through every single record to find out? That could take a lot of time! If you’ve recorded the Parent Account for each account that has one, Salesforce can generate a family tree for your account. The hierarchy shows this relationship for the Get Cloudy Consulting accounts. To view an account’s hierarchy, click on the Accounts tab and select an account. Click the View Hierarchy link next to the Account Name field. You have two basic choices when you’re deciding how to establish accounts for businesses with multiple locations. You could establish one global account and link all contacts, opportunities, cases, and so on to that single overarching account. Using one global account makes it easy to find that account’s records and to report on that account at the enterprise level. But it’s harder to manage a large mass of information, and not being able to easily view the big picture might make it hard to see what each location needs from you for your relationship to be successful. Establish accounts for each location and create contacts, opportunities, cases and so on separately for each location. With this option, you maintain more accounts and need to set up a few more complex reports to get the big picture. But using multiple accounts means you can take advantage of account ownership, hierarchies, specific sharing settings, and more granular reporting. You can also more easily track and report on opportunities, cases, and other interactions for each account. We recommend establishing accounts for each separate location, rather than squeezing all locations into a single global account. This arrangement lets you concentrate on customer success in each location while still giving you the ability to put the big picture together. Unless your company is teeny tiny, it’s likely that more than one person works with each account. For example, the team of employees for an account might include a sales rep, sales manager, support agent, support manager, and marketing personnel. A Salesforce Account Team can contain up to five people, each of whom can be assigned different roles and different levels of access to the account and its opportunities and cases. Like Contact Roles, Account Teams isn’t set up automatically. An administrator must turn it on and set up the roles that each team member can be assigned. From Setup, click Customize | Accounts | Account Teams. Select Account Teams Enabled and click Save. Select the account page layouts on which to include the new Account Team related list and click Save. Optionally, you can also select Add to users’ customized related lists to add the Account Team related list for users who have changed their personal settings for Account record pages. Optionally, click Team Roles to review or edit team roles. On the Accounts tab, select an account to view and scroll down. On the Account Team related list, click Add. Click the search icon to select a Salesforce user to assign to the team. If you haven’t set up any other users, the only person that you can assign to the team is yourself. For each team member, select a level of access to the account and to opportunities and cases related to the account. For each team member, select the team member’s role. After you add an account team, the button Add Default Team displays right next to Add button. Default Teams is a shortcut that saves you from having to enter the same members into the same form over and over again. If the same people usually work together, create a default account team and assign them to it. You can even set Salesforce to add your default account team every time and eliminate the need to click buttons at all. Visit Setting Up Default Account Teams to find out how.